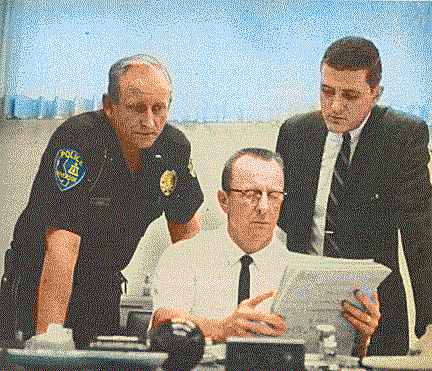 Lieutenant Gren, Captain Cross and Detective Mullen view the evidence. Click to enlarge. Here we will take a fresh look at the Cheri Jo Bates murder in Riverside on October 30th 1966, using the 'Confession' letter, excerpts from Robert Graysmith's book, details from police, and earwitnesses to pinpoint the location of Cheri Jo Bates' Volkswagen Beetle and the vehicle of her assailant. The 'Inside Detective' Magazine from January 1969 stated "At the murder scene, drops of dried blood leading from the body to Terracina Street indicated to the detective that the murderer had walked back to the street following the slaying." This indicated the killer was walking back to his vehicle, parked on Terracina Drive. But which way did he head, east or west. The Riverside City College library annex was situated approximately 45 yards (135 feet) east of the alleyway, where the slain girl was discovered. There are, as always, conflicting versions of the same event. ​The 'Inside Detective' Magazine stated "The Riverside Sheriff's Department picked up the broadcast. Minutes later, Sheriff's Detective Sergeant Jack Reid and Detective Jack Elms discovered the little car. It was parked at the curb in front of the college library about 75 feet (25 yards) from the entrance of the roadway where the girl's body was found." Robert Graysmith, in his book Zodiac. stated "He probably came up and offered help, offered her a lift in his car. Then he got her to go down the unlit gravel road to the parking lot, about 75 yards east of her car." The Riverside Police Department memorandum stated "She returned to her vehicle, which was parked on a city street a short distance from the library, placed her books in the vehicle, and attempted to start her vehicle, The vehicle had been tampered with so it would not start. This was evidently done by the suspect to keep the victim near her vehicle, so the suspect could make his approach. Our victim then left her vehicle, accompanied by the suspect, and walked approximately 200 feet (67 yards) into a dirt driveway between two houses." Below I have interpreted the statements. One vehicle is placed between 67-75 yards west of the alleyway (which was "about 75 yards east of her car"). The second interpretation places the vehicle "in front of the college library" about 25 yards east of the alleyway. These appear the two options. Next we will examine the 'Confession letter' wording to pinpoint the location of the assailant/s vehicle, along with the true location of Cheri Jo Bates' Volkswagen Beetle. The 'Confession' letter stated "Then I waited for her in the library and followed her out after about two minutes. The battery must have been about dead by then. I offered to help. She was then very willing to talk to me. I told her that my car was down the street and I would give her a lift home. When we were away from the library walking, I said it was about time. She asked me "about time for what." I said it was about time for her to die." If the author of the 'Confession' letter was honest in his directional movements that night, then his choice of words "when we were away from the library walking," seems to suggest he was walking away from the library, towards the alleyway and his vehicle, having already offered Cheri Jo Bates help in fixing her Volkswagen Beetle. This indicated that Cheri Jo Bates' vehicle was parked somewhere close to the library, and going by the above options, 25 yards east of the alleyway. ​If her disabled Volkswagen Beetle was parked 70 yards west of the alleyway, then his statement in the 'Confession' letter of "When we were away from the library walking, I said it was about time. She asked me "about time for what." I said it was about time for her to die," makes it appear he is heading in the wrong direction. Considering the relative position of the Volkswagen Beetle (70 yards west) and the alleyway in this instance, he would have been walking towards the library, not away from the library. However, the Volkswagen Beetle being parked 25 yards east of the alleyway flies in the face of the Riverside Police Department memorandum, which indicated her vehicle was parked 200 feet (67 yards) from the alleyway. The Riverside Police Department memorandum and Robert Graysmith's book appear to corroborate one another in terms of distance from the alleyway. But what if the Volkswagen Beetle was parked 67-75 yards east of the alleyway, instead of 75 yards west, as Robert Graysmith stated in his book. This would literally place the Volkswagen Beetle very close to the library doors, using the measurement capabilities of Google maps, and corroborate the Riverside Police Department memorandum, which stated "her vehicle was parked on a city street a short distance from the library." This also tallies with the 'Inside Detective' Magazine, in which police said her Volkswagen Beetle "was parked at the curb in front of the college library." They did however, go on to state her vehicle was 75 feet from the alleyway, not 75 yards. But it's my guess they made a mistake or were misquoted. One wouldn't have imagined parking spaces that difficult to find on a Sunday evening, particularly bearing in mind Cheri Jo Bates had arrived at the library around opening time, before many of the other 65 attendees. This may also challenge the notion of her parking her vehicle 120 yards (360 feet) from the library entrance, along Terracina Drive, leaving her an unnecessary distance to walk. This revamped assessment now places her vehicle approximately 75 yards east of the alleyway, very close to the library, and "parked at the curb in front of the college library." Or "parked on a city street a short distance from the library." Not on the west side of the alleyway as originally believed. But where was the assailant's vehicle parked? In the 'Confession' letter the author stated he "waited for her in the library and followed her out after about two minutes." We know that Cheri Jo Bates was not murdered until approximately 10.30 pm, so much of what the 'Confession' letter depicts is false, however his wording can still give us a clue to the location of where his vehicle was parked. It is extremely likely the killer either trailed Cheri Jo Bates to the library that evening, or pulled up near to the library on the expectation of her arrival, maintaining a visual on the entrance. Regardless of what time she entered the library, or where she went that evening, the assailant would have parked somewhere on Terracina Drive to facilitate his plan, hence the wording on the 'Confession' letter: "I told her that my car was down the street and I would give her a lift home." and "when we were away from the library walking." This indicated his vehicle was parked west of the library entrance, towards the alleyway. He clearly didn't want to park his vehicle by the Riverside City College library steps, as this would risk his vehicle being associated with the Volkswagen Beetle of Cheri Jo Bates. The wording on the 'Confession' letter of his vehicle "down the street," to lure her towards the alleyway, would suggest his vehicle was somewhere close to the alleyway. This would facilitate a speedy exit from the alleyway after the knife attack on Cheri Jo Bates, which would inevitably have left him with blood on his clothes. This was backed up by earwitnesses close to the alleyway, who likely heard the perpetrator's vehicle pulling away from the scene. In the Robert Graysmith book it stated "A neighbor heard an 'awful scream' between 10.15 and 10.45 pm, and then about two minutes of silence, and finally the sound of an old car starting up." The neighbor's claim is backed up by the latter part of the 'Confession' letter: "She died hard. She squirmed and shook as I choked her, and her lips twitched. She let out a scream once and I kicked her head to shut her up. I plunged the knife into her and it broke. I then finished the job by cutting her throat." After Cheri Jo Bates screamed, according to the author, he kicked her and then used the knife twice to finally kill her. Taking this at less than 30 seconds, and assuming the killer and starting car are connected, what did the killer do for the remaining 90 odd seconds. If his vehicle was relatively close by (30 seconds journey)- so that the neighbor was able to hear it starting up, then we are probably looking for an unaccounted minute of time. Was this time used in searching for the Timex watch, wrenched off his wrist in the struggle with Cheri Jo Bates. Based on everything learned, the Volkswagen Beetle of Cheri Jo Bates was likely parked very close to the library annex, 75 yards east, or thereabouts from the ill fated alleyway. Her vehicle would have been parked approximately 30 yards (90 feet) east of the library entrance. The assailant's vehicle was also parked on Terracina Drive, within earshot of the alleyway, on either the east or west side. "At the murder scene, drops of dried blood leading from the body to Terracina Street indicated to the detective that the murderer had walked back to the street following the slaying." But only a matter of yards from the alleyway, before driving away. FOOTNOTE: Newspaper article excerpt - Death on a Driveway, A life that ended too soon. "Some of her friends were at the library between 7 and 9 pm, but none can recall seeing Cheri. She had been there, however, because three books stamped that day were found in the front seat of her yellow-green Volkswagen found parked on Terracina, near the annex. Someone else was there too. Someone who police believe knew Cheri- knew her well enough to recognize her car. The distributor had been tampered with and there was evidence that the man had been in the car with her. The keys were still in the ignition when the car was found the next day. Both windows had been rolled down and the right door was ajar." Nice article Richard. Do you have any info on the two people who failed to show up when the police did of re enactment of the night where Cheri was killed? I beleive it was reported that a heavy set man and a woman were at the library but both failed to co operate with police. Unfortunately no more than anybody else. A heavyset man with a beard and a woman spotted on October 30th 1966, failed to show up for the library reconstruction on November 13th 1966. There could be any number of reasons for this, other than suspicious. Shame there are no sketches of the couple. Richard, I found a document written by the detective in charge of Cheri's case Captain I. L. Cross that may help pinpoint where Cheri's car was parked. The relevant excerpt states: "Victim parked her vehicle in front of Riverside City college Library just prior to 6 PM and entered library building.Suspect either forced or enticed her approximately 300 feet to an unpaved parking area between two vacant houses where he attacked her with a small knife." Based on this document it sounds like her car was parked in front of the Quad building very near the library. Cheers Monarch. I for a long time have accepted Graysmith's account of her vehicle parked 75 yards west of the alleyway. I believe he meant 75 yards east. All the other 'reports' I have read say her vehicle was either parked by the library annex or very near. It certainly makes more sense than parking her vehicle 350 feet away. The Confession letter, if from the killer, makes it appear she is murdered shortly after 6.00 pm, which is extremely unlikely based on the fact her body would be lying in the alleyway all evening and the alleged female eyewitness of a male smoking a cigarette at 9.30 pm certainly would have noticed this. There were also two to three earwitnesses of a scream around 10.30 pm. However, the Confession letter, if true, does indicate the perpetrator is walking west away from the library and Cheri's Volkswagen Beetle before he reaches the alleyway. Assuming her vehicle was parked yards from the library annex, the Confession letter would suggest the author knew the correct position of her Volkswagen Beetle, and help the case for the letter being genuine, rather than a hoaxer. -Department of Justice Report: "Investigation by the Riverside Police Department revealed that the victim had been at the Riverside City College Library on Sunday October 30th, at 1800 hours. The victim's vehicle, a 1960 Volkswagen, was found parked in front of the library on the morning of the thirty-first."